GISS Improv coach Jason Donaldson gives his team instructions on Thursday night at the team's fundraiser show at the Legion Hall. 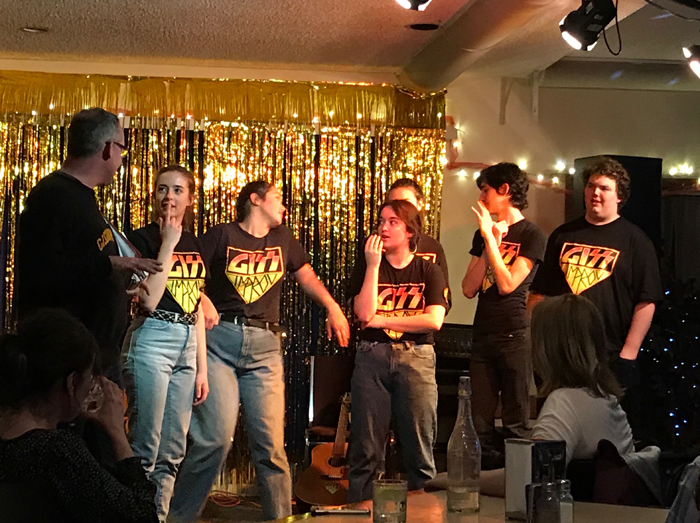 Gulf Islands Secondary School’s senior improv team is spending spring break on a fundraising burst in aid of their upcoming trip to the national championships in Ottawa, with their main event coming up this Saturday night at Mahon Hall. This will be the team’s third trip in as many years to the National Arts Centre. They secured the Canadian championship title in 2017 and the silver medal in 2018. They will be looking to recoup their gold medal at the weeklong competition and festival running April 1-4. Saturday’s fundraiser event includes performances by the senior and junior teams, plus a silent auction featuring many fine items. These range from 10 loaves of fresh bread made by Barb Slater and a smoked pork shoulder to a Tigh-Na-Mara package and Vancouver Island Musicfest tickets. The show starts at 7:30 p.m.